Apache offers superior firewood processing equipment and accessories, including the 300 Highway, the 300 Hydraulic, the 375 Basic, and the 375 Pro. 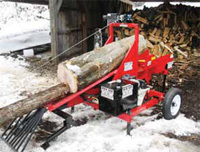 The Apache Model 300 Japa firewood processor is designed for one-person operation and is capable of processing logs up to 12” diameter and bucking up to 20” length. It has a production capacity of approximately one cord of firewood per hour. It has an independent hydraulic system and is powered by a 13HP Honda engine. It comes with a hitch, highway subframe, and suspension axle. The 300 Hydraulic is also designed for one-person operation and has the same production capacity as the 300 Japa. It features a 10.5’ output conveyor and 5.6-ton splitting power. It is conveniently driven by the hydraulic system of your tractor or skidsteer. The most economical high-performance processor is the 375 Basic that processes 2-3 cords/hour, up to 14 1/2” diameter logs. It features a 7.5’ infeed conveyor with extra hydraulic connection for live feed roller, 2 or 4-way splitting, 14’ swiveling output conveyor, separate lube oil for the saw chain, 5.6 ton splitting, manual or automatic splitting. The 375 Pro is well built and designed to give years of service to the professional. Able to process 2-3 cords/hour, it features 14 ½” diameter capacity, a 7.5’ reversible infeed, hydraulic log stopper, 2, 4, or 6-way splitting, and much more. Mascinen Solutions from one Professional to another Professional — this has been the strategy behind BGU-Maschinen since 1970. As a result, the company has developed a broad portfolio of machines for wood processing. BGU’s machines are simple to operate, have superior functionality and provide high quality with an excellent price-quality balance. 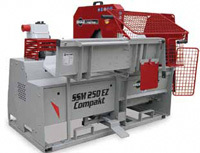 The SSM 250 EZ Compakt is a combination saw and splitter processor. It allows the operator to perform two productions steps with the speed of one. A foot pedal operates the split cylinder and the wood (cut in the first step) is pushed through the split blades. It can product 3/5 cords hour and has an adjustable cut length from 10 to 20 inches. Blockbuster Inc. has been manufacturing firewood processors for over 20 years. The company currently offers eight different sizes with a variety of specifications. Blockbuster can also customize your machine to help fit your particular needs. The Cord King Compact firewood processor has been in production since 1978 and is sold worldwide. Simplicity of design is a hallmark of its machine. “Off the shelf” components ensure availability of spare and replacement parts at competitive prices. The Cord King Compact maximizes your productivity by allowing you to produce more than 9,000 full cords in a standard working year (220 days). The Cord King’s unique design accurately cuts and splits your wood with a cycle time of 3-4 seconds. By using the optional splitting blades, you can match your raw material with the required finished products, thereby optimizing your profit. If your business requires a specific machine or machine option(s), Cord King will provide a custom manufacturing service. The SC-14 is DYNA’s most popular model, suitable for operations processing 1000 cords a year, while the SC-16 was developed from demand of SC-14 owners who wanted even greater output. This year DYNA is responding to customers who want a smaller, more affordable machine with the SC-12. The SC-12 is a scaled-down version of the SC-14. Options include a 6-foot integrated conveyor and an innovative “Log Lifter” mechanism that eliminates the need for a skidsteer or loader to get the logs off the ground. A high-performance version SC-12XP is outfitted with a larger 20hp HONDA gas motor and enhanced splitting acceleration. With 10 models to choose from, the Palax firewood processors are available in both chain saw and circular saw versions for processing wood up to 19” diameter. Producing one to three cords per hour, depending on model and setup, the machines are PTO driven — some with a 3-point hitch. PTO power packs are available for some models. Depending on model, adjust the length of the log from 10” to 26” and split the wood up to 12 ways with up to 52,000 lbs of force. The newly introduced Wolverine firewood processor has been built and tested by Hud-Son Forest Equipment. This machine is designed with the homeowner, farmer, and small wood businessman in mind. This unit is extremely portable and can be moved into small or remote areas with the use of an ATV. With a 10 HP engine running a 2-stage hydraulic pump, the splitter is powerful and fast. It can be operated from one control valve and allows you to split wood into two or four pieces. With the use of your personal chainsaw, cutting wood to a desired length is simple, and you are in control of the length and speed of the cut. The Wolverine has a hydraulic winch that pulls your log of any length into the machine with the maximum diameter of 18”. You can easily set this machine up in minutes so moving to another location can be achieved quickly and easily. Rainier Hydraulics has been the proven leader in shear technology for producing firewood since 1984. The patented CHOMPER system is the only fully automatic processor available. 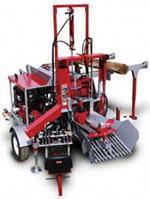 The portable, self-contained machine automatically feeds the log, cuts to length, and splits. splitter heads, infeed conveyors, and live log decks. All CHOMPERS use a shear blade for cutting to length and require only one person for operation. All of the competitive processors require a minimum of two people and other supporting equipment for functional operation. The difference in labor costs of one person can pay for the CHOMPER. Resource Recovery Systems Inc. (RRS) is known for bringing customers forestry machinery equipment that is affordable, versatile, and performs. After two years of R&D and numerous units in the field, RRS offers maximum value performance with its “MVP” BEAVER Firewood Processor line. The “MVP” processors are manufactured in Hartford, Wisc. With a variety of models, they are versatile and powerful enough to fit everyone’s needs, from hydraulic splitters to chainsaw operated cutting models with PTO, gas, or diesel power. The Beaver MVP Model 18 is the only true electric over hydraulic-proprietary hydraulic system on the market, says the company. Gas or diesel models operate with a two hydraulic ram regenerative system; the second cylinder is actuated only when a heavier splitting force is required. 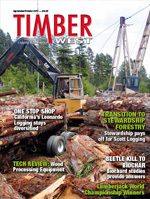 Timberwolf’s most popular firewood processor — the PRO-MP — is designed to be operated by one worker. With its live deck, patented Top Roll clamping system, and roller guide, the PRO-MP is a productivity powerhouse. It can handle 14’ logs up to 18” in diameter and features a super fast (6-second) hydraulic cut-off saw. The MP is powered by a 36HP Yanmar engine and comes standard with a 4-way wedge. Timberwolf also manufactures firewood conveyors and says that almost all firewood processor buyers purchase a conveyor to go with it. Optional accessories include an operator’s seat, 6-way wedge, and a choice of standard or pintel hitches. Timberwolf processors are cut and welded by hand and assembled in the U.S.A. with US-sourced components. The Multitek 1620 SS Firewood Processor features the innovative and patented guillotine cutting system, which reduces maintenance and increases machine productivity. The 1620SS features a 40-inch insert tooth circular saw that eliminates bar oil and chainsaw related maintenance. With productivity and low maintenance in mind, this machine also features a 30 percent increase in production over bar and chain models and a significant reduction in maintenance costs. The 1620 SS is rated at 2 to 3 cords per hour and can accommodate logs in excess of 20 inches in length up to 16 inches in diameter. The guillotine cutting method allows a circular type cut off saw to be utilized on a smaller wood processor. The straight up and down motion eliminates any side-to-side weight transfer, increasing the longevity of the machine and making the machine more user friendly. With he insert tooth circular saw, easy maintenance that can be performed with the blade on the machine. The insert teeth last approximately 500 to 700 cords of logs until needing replacement.